Danny Pearl was born on October 10, 1963, in Princeton, New Jersey, and grew up in the Los Angeles area. He had two sisters. He attended Stanford University where he co-founded the student newspaper Stanford Commentary , graduating in 1985 with Phi Beta Kappa honors. He was a Pulliam Fellow summer intern at the Indianapolis Star before joining the North Adams Transcript and the Berkshire Eagle . He moved to the San Francisco Business Times and joined the Wall Street Journal in 1990 in the newspaper's Atlanta bureau. He worked in the Washington, London and Paris bureaus, reporting as a Middle East correspondent. Pearl was aware of the dangers that reporters faced. He filed a report to his Journal editor with recommendations to improve the safety of reporters. In October 2000, Pearl became the South Asia Bureau Chief for the Wall Street Journal . 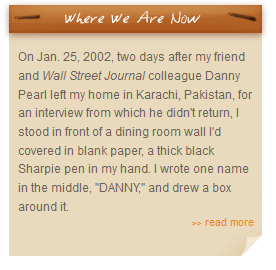 After Sept. 11, 2001, Pearl reported in Pakistan, where he was kidnapped on January 23, 2002, and subsequently murdered. A book, At Home in the World , has been published of Pearl's writing. Read some of Pearl's	writings here.